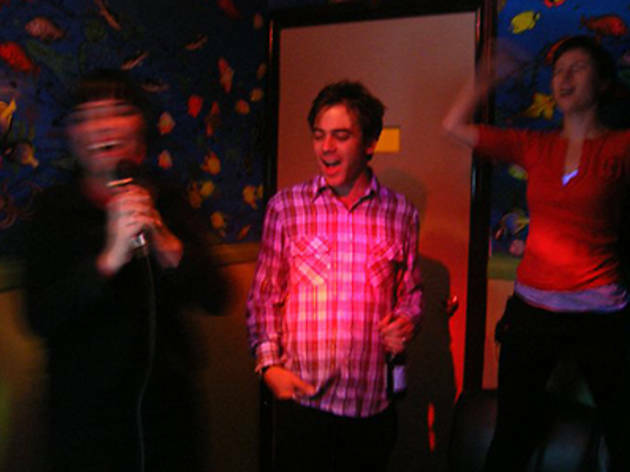 The classic Sydney karaoke club may not boast the most amazing song selection, but it does have fluoro hieroglyphs painted on the walls. Do your sweet singing thing surrounded by pink sphinxes and a lurid green Horus. Out the front, they serve cheap Korean beers and prawn crisps. This is an old-fashioned, books-only system (none of that touchscreen business here), complete with a dodgy old remote that you basically have to sit on to make work. It’s fine if you want to go on a K-pop or Kate Bush rampage, not so fine if you’re after Tina Turner, Patti Smith or Johnny Cash. Remain open to singing an entire set of Belinda Carlisle. This was once one of Sydney’s most violent karaoke joints. They still have bouncers out the front with metal detectors but the most trouble you’re likely to get into now is getting caught on the tables. Rooms from six people ($30/hour) to 15 people ($80/hour).